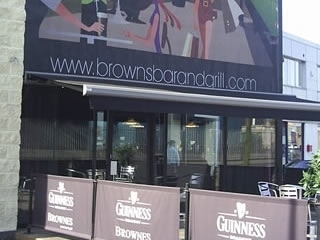 On Belfast's Boucher Road, Browne's Select Bar & Grill has opened it's doors to create a great new pub and food venue. Be it business lunch or social gathering with family and friends, Browne's is perfect for everyone. With a seating capacity of over 100 downstairs, the bar offers great food and superb service. Designer Paul Horsecroft has created a traditional bar with a modern feel. The open fire and log wall effect are warm and welcoming while the spacious dining area with it's open plan kitchen and quarry stone wall adds sophistication and uniqueness to Browne's. The only fully licensed premises on Boucher Road, Browne's has already become one of the most popular eateries and watering hole in Belfast. The team of chef's have also put together an evening menu to delight everybody's palate with a full and varied wine list. To compliment this, great meal, wine and beer deals are always available, changing weekly. As if that's not enough, this venue has an exclusive first floor bar, The Q Bar. Available for private functions, this floor has two plasma screens, showing all major sporting events, American pool tables and a comfortable lounging area. So whether it's a boy's night out, a bite to eat or a game of pool and a pint, Brownes has something for everyone. During the summer months, the enclosed South facing decked area is ideal for lazy afternoons in the sun. For further information or bookings, telephone 028 9066 0995. Car parking available. Have you got Google Earth on your computer? If so, then download the Google Earth view of Brownes Bar & Grill. Is this the wrong position for Brownes Bar & Grill? If you think so, then modify its position. Click / Tap the button above to get directions from where you are to Brownes Bar & Grill. went to brownes for lunch the other day and have to say it was top notch , got a fry , it was huge !!! and was quality !! Decided to try this place for lunch and I'm sorry I did. It was grubby, cold, and food was very very average!! Waste of money, could have cooked better myself for half the price. Won't be back. absolutely amazing time at Browne's. the staff are the best thing about the place, they're all so down to eart and aren't afraid to have a laugh with you, sometimes you go into a restaurant and the staff are very down, dont smile and just set the food in front of you but with brownes its a whole different story! the head chef is brilliant, always talks to kids etc such a nice guy really funny. the portions i found are actually too much, the size of the plates! i mean... WOW. the only thing i dont like about it is the curry, not my cup of tea but i have heard some people really like it. their fish is to die for, they would have like salmon or chowder... yum! their chicken goujons are really nice too, again you get loads. the value for money is excellent!!! food amazing! craic great with the staff! a brill night out with the guys n galls!! foods great n sooo cheap service amazing n the chef is a gentleman!,, book early to avoid dissapointment!! amust try. browns is kicking these days good place to be..for lunch..diner or even a fab night out. Just wondering if anyone knew if Brownes had reopened yet? Would like to go there tonight if possible! Browns has now closed. It's a pity, I've spent many an afternoon/evening here enjoying good food and drink with my work colleagues. It will be missed! I would just like to say that I visited Brownes Bar and Grill last Friday afternoon and my girlfriend and I were extremely impressed with the food and thought that both our meals were lovely - and my girlfriend is a very picky eater and sometimes extremely hard to please (especially when it comes to food)?! For the record I had the Chinese Chicken Curry with half chips and half rice and my girlfriend had the Chicken Goujons with chips. went to brownes got 2 beautiful meals and a btl of wine for £20 couldnt believe it value for money and great food this is my new local!! went to brownes to celebrate my friends birthday-had a great night the staff were excellent more than helpful and very friendly, food was beautiful and plenty of it thank you brownes for a great nite by all-will defo be back!! I was very disappointed with the whole thing, the food portion was ridicoulous for ths price of it, the chips were very dark and wouldnt even be a portion to fill a child! no one even came to ask if we were ok or needed anything else, there isnt even a kids menu available!! When we got are food it was cold we had to ask for more and for it to be heated!! When we recieved our bill we almost refused to pay only we thought it would be a better idea to put an article in the paper, our waitress we personally thought she could have gave us slightly more attention!! Definitely a great spot. Staff excellent and superb atmosphere. Great night out! Fully recommend it. Foods good and staff are friendly every time I've been. would def recommend. Love Browns! The staff are more than helpful, which isn't often found in many other restaurants. Food is tasty and reasonably priced. Atmosphere relaxed. Location strange but suitable for shoppers using Boucher Road facilities. Well done Browns! The food's top notch, the bar's top notch, the staff are dead on - and a bottle of wine and 2 mains for £20? Great stuff, keep it up! Went to brownes and thought it was a delight will be back and havent stopped talking about it to friends and family,especially the manager very friendly and couldnt have been nicer!! love it, great wine deal, great food and the staff are friendly. How can you go wrong. I went with two work colleagues last week. I don't like to complain but the service and food were poor. Must Try harder! browns very very good food great and staff were more than friendly which in belfast is a rare thing! went on easter sunday and it was great deff go back. I visited browns in the summer and have been a regular visitor since. It is actually became the venue for every family occasion, my parents go all the time and my friends have too many lunches there and get very angry when I am not present. I find the staff very friendly and the food is delicious. would highly recommend. Very friendly staff, good great and if you don't like whats on the menu they'll make you something up. Its an odd location for a bar though, haven't tried it late at night.